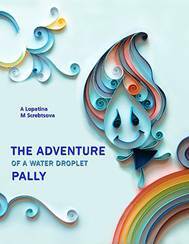 These ecological tales about the Small Water Droplet teach children to view their natural environment as they do their own home - as something that they share with others. This HOME needs the loving attention and care of everyone on earth, including children. Each story is delivered in an entertaining fairy-tale representational form and tells about the laws of nature and the environment. Quilling, also known as paper filigree, it has been around since the Renaissance age, but I was only recently introduced to it by my friend. This art of cutting and curling narrow strips of paper and laying them on edge to form intricate filigree designs sparked my interest and I found it fun and pretty relaxing. When Karina, the young artist, suggested making artwork illustration in paper quilling for our ecological fairytale about water drop, I was happy. But I cannot even imagine what a talented artist can do with just a few colorful strips of paper. 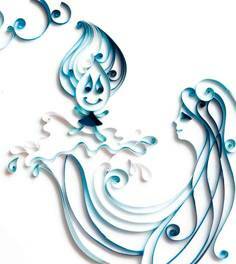 To see the fairytale with quilling artwork illustrations one feels like a MIRACLE! I'm a fairy taller and the author of the numerous children's books but I haven't seen the illustrations for the children books as impressive as quilling artwork illustrations made by Karina. They are really magic, fairy and brilliantly introduce the conception of the book. 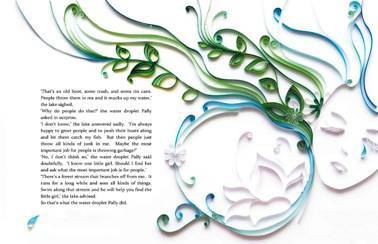 Quilling artwork illustrations gives the book a magnificent look! 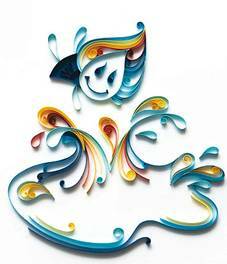 These artwork illustrations for the children book take quilling in the whole new level. 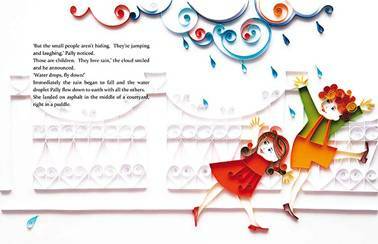 This is the first our book illustrated by the talented artist. Now Karina is at work on the next book "The Golden Bee" about healing property of honey, and I can't wait to see her next artwork.